Morton’s neuroma is common with long-term wearing of improperly fitted shoes and is frequently seen in women as a result of wearing certain types of high heeled shoes. It can usually be diagnosed by a careful clinical examination. Radiographic studies can show degeneration and an MRI can show other etiologies such as bursitis, scarring or degeneration of the bone. 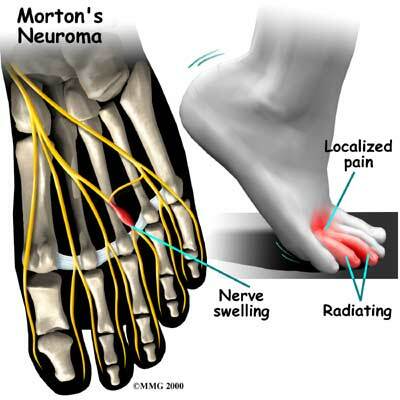 Treatment for Morton’s neuroma is usually conservative with physical medicine modalities, possible modifying footwear. In severe cases, surgical intervention may be necessary. Localized injections with anesthetic and corticosteroids may help control inflammation, and thus reduce pain. If Morton’s neuroma is due to degeneration of the bones or scarring fibrotic tissue, platelet-rich plasma (PRP) and stem cell therapy may help to diminish or regenerate the evolved area. Platelet-rich plasma (PRP) and stem cell therapy are regenerative medicine techniques which may regenerate tissues that are chronically irritated and inflamed or undergoing degeneration or scarring. Additionally, stem cell technology can help regenerate damaged tissue. Stem cells can be processed from a person’s own fat cells or bone marrow. Once processed, the stem cells are directed into the injured tissue using a variety of techniques. If you suffer with Morton’s neuroma and your current treatment plan leaves you feeling hopeless, perhaps a fresh set of experienced eyes can change your outlook. Since 1990, Dennis M. Lox, M.D has applied his personal interests in sports medicine, cutting-edge regenerative medicine and chronic pain management to helping patients increase their quality of life. Contact us for an appointment at 727-462-5582.